Q: My 16-month-old toddler is very reluctant to go down for her second day-time sleep, but I still think she needs it. 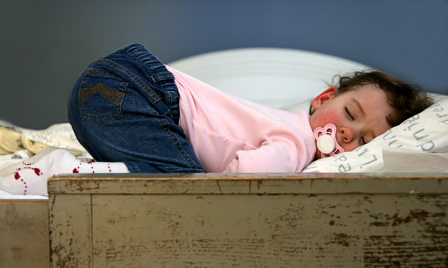 When do children only need one sleep through the day? Nicole's Answer: At the age of 16 months your daughter would be in the process of giving up her second daytime sleep. Usually around the age of 18 months you would expect your daughter to be only having one sleep in the middle of the day for a good two hours. With the first sleep it should be in the morning around 9 or 9.30am and a short sleep say 45 minutes to an hour. If she has it in reverse then you need to encourage her to swap the sleeps around as you are aiming for the one big sleep in the middle of the day. I recommend that while she is in the process of transitioning from two sleeps to one that she still has rest time for the 45 mins in the morning which is in her room or pram, relaxing, quiet reading or quiet play. to herself to wind down and relax and be in a better mood to interact with her family until she has a sleep at lunch time. If she falls asleep during this time you may need to wake her after a sleep cycle of 40 mins so that she still has her lunchtime sleep and can sustain herself. This period will last about four weeks or so. 1-2 year feed, play, sleep routine.